Oh candy, my old friend. It’s been too long. The last time we had fudge around here was last Easter, so I wanted to come back with my fudge-game strong. 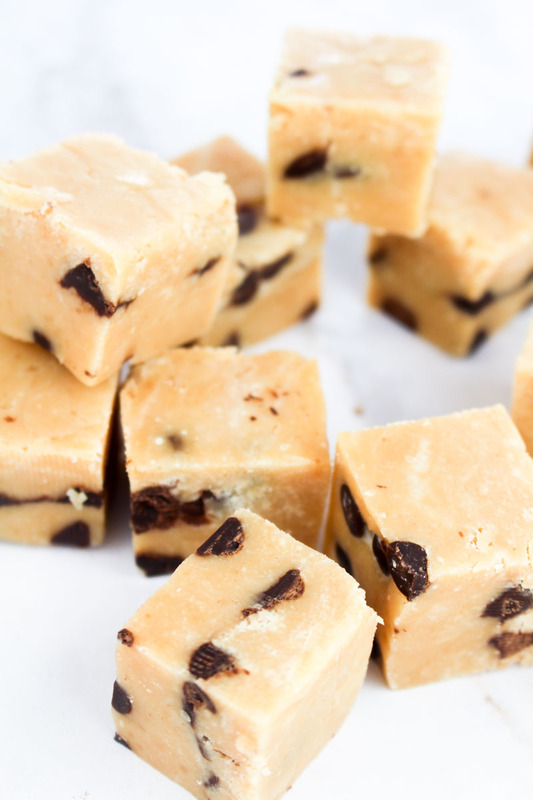 And this Peanut Butter Chocolate Chip Fudge is about as good as fudge gets, in my opinion. How many times can I use the word ‘fudge’ in one paragraph? Fudge fudge fudge. Truth time. This isn’t ‘proper’ fudge. This is a delicious pseudo-fudge made by heating up some smooth peanut butter, icing sugar, butter, and a little bit of milk. Add a pinch of salt and some vanilla extract, and you’ve got yourself something that tastes *almost* like the real thing, without ever having to bother with a sugar thermometer. In fact, the only slightly difficult thing here is to try and stop the chocolate chips from melting. Okay, and maybe trying to stop your wife from eating it all before you’ve taken photographs. You can try and stir the chocolate chips into the warm fudge if you like, but I dear this may result in something a bit more swirly than chippy. Instead, spoon half the fudge mixture into the pan, flatten it out, and then press the chocolate chips into it. Spoon the rest of the fudge on top, and gently level out. I did press some chips into the top of the fudge, but I actually wouldn’t recommend this as you get little pools of white from the butter that doesn’t look all that pretty. Feel free to do layers of one third of the batter each time, pressing chocolate chips in between the three layers of you want a bit more variance in the position of the chips. 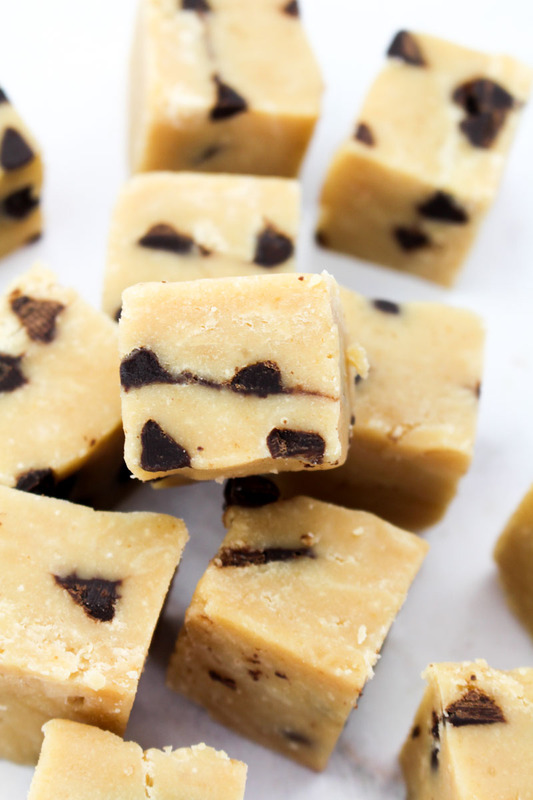 Easy to make salty peanut butter fudge, studded with dark chocolate chips. Line an 8 inch square brownie tin with aluminium foil, and set aside. Place the peanut butter, unsalted butter, vanilla extract, and salt in a medium sized saucepan over a medium-low heat, stirring occasionally. Once completely melted, remove from the heat, and add half the sifted icing sugar, and stir well. Add the milk, mixing well, and then stir in the remaining icing sugar. Spoon half of the fudge into the lined tin, and smooth out. 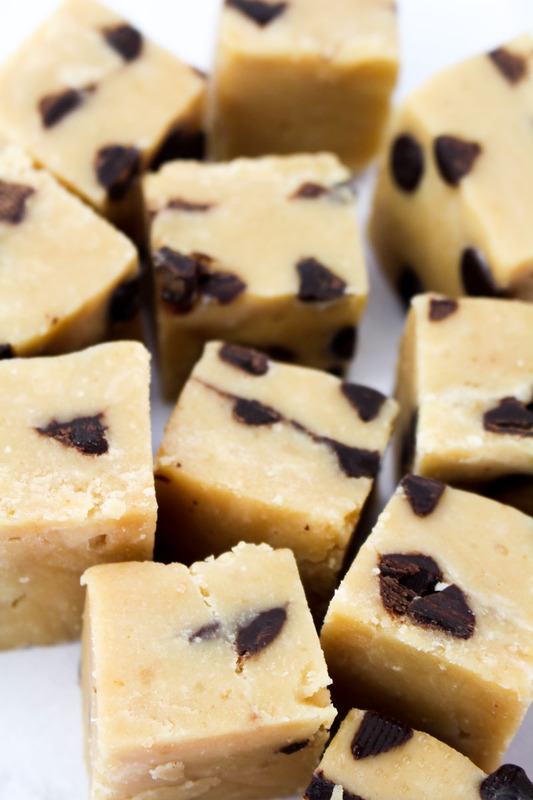 Press the chocolate chips into the fudge layer, and then spoon the remaining fudge in top. Smooth out the top with a palette knife, and then pop in the fridge to set for 3-4 hours. Once set, remove from the tin and chop into 1 inch squares. The fudge will stay fresh for 2 weeks if stored in an airtight container in a cool place, or in the fridge for up to a month. The fudge can also be frozen for up to 3 months. 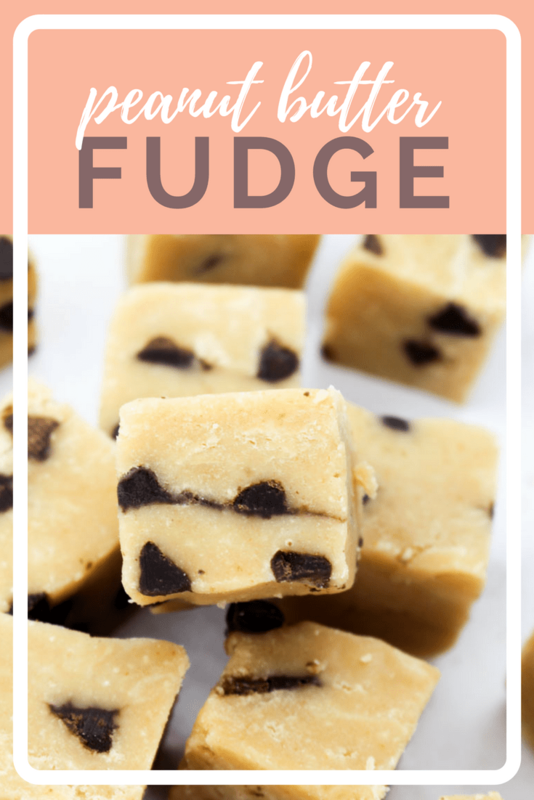 I feel that this was your best, most creamy and fudgey version of fake-fudge (fauxdge?) so far. I mean, obviously anything peanut based I will be all over, but it was delicious.